There’s a reason that the BBC Springwatch team are basing themselves here in the Cairngorms National Park in 2019 – it is the most amazing place for wildlife! Organisers of the Cairngorms Nature BIG Weekend are inviting anyone to come and experience the area themselves. The weekend will run from 10-13 May. 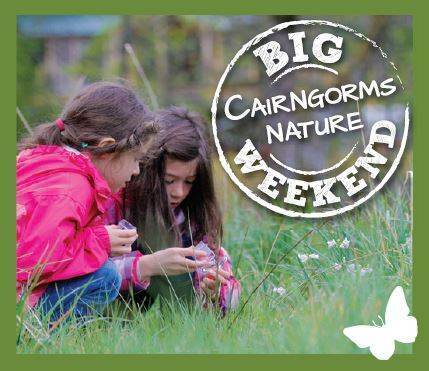 With over 80 activities taking place across the Cairngorms National Park there will be something for everyone, from families and those who are new to wildlife watching, to the more seasoned nature lover. The weekend kicks off with a dynamic talk from Cairngorms Connect the UK’s biggest and most ambitious ecological restoration project, a panel of speakers will discuss their 200 year vision for the Cairngorms. There are lots of activities over the weekend suitable for children. You could join Zeki Basan in Rothiemurchus creating light from tree sap and sipping pine needle tea. You can take the Capercaillie Challenge at Carrbridge, or head to Blair Atholl for a kids wildlife photography session. Get involved in the Great Cairngorms Swift Race at the Glen Doll Ranger Base, a pond dip at Boat of Garten, or family bushcraft at Glen Tanar. For the seasoned nature lover there will be opportunities to get close to some amazing species and meet the people who live and work in the Cairngorms National Park. Including ‘behind the scenes’ tours on estates and Lynbreck Croft – currently featuring on BBC’s This Farming Life – specialist events at places like Insh Marshes and Scalan Mills and talks on a range of topics including, climate change, and gaelic in the landscape. There will also be opportunities to give something back to the Cairngorms and get involved with a volunteering event. Organisers say it’s immensely satisfying to offer your time to vital conservation work, you’ll have fun, meet new people and know you have made a real difference. See the programme and book events at the Nature Big Weekend website.